Many so-called supporters of Gov. Palin are aghast that she suggested a title could shackle and take away her freedom. There’s quite a bit of “she owes us,” “she’s not running,” and “she better run” being thrown around the comment boards on all the Palin sites. Nothing in her statements with Greta Van Susteren Tuesday night indicated a GO/NO GO on a POTUS run – nothing that is, except words that supporters who should know better put in her mouth. We want Gov. Palin to run for President and have been egging her on for three years now. Many of us wanted her to run when wanting her to run was “not cool.” We supported her knowing that she might not run. Second, no one forced anyone to support Gov. Palin. She did not extort, bribe, con, or cajole our support. We gave it willingly of our own volition. She does not owe us anything and people who think they’re owed need to get over it and get over themselves – especially those who think they did so much that she owes them a paid position. For those “supporters” who didn’t get the memo, Gov. Palin is not for sale, does not run a pay-to-play operation and is not a crony capitalist. Third, Gov. Palin will make her decision on her terms after carefully considering all the factors, including – and especially – whether she can be more effective doing what she does now, or more effective campaigning for – and hopefully – winning the Presidency. Support means respecting her decision whatever it may be. It’s mind-boggling that some of the same supporters who want her to run for President and announce right now are ready to jump ship if she doesn’t do things their way and on their schedule. We’re back to some people needing to get over themselves. Fourth, Gov. Palin made a promise on at least four different occasions to a local Alaskan radio show that they would be the first to know of her decision to run or not. Every interviewer on Fox News has tried to get Gov. Palin to tip her hand or announce on their shows in practically every airing over the past nine months. They have asked just about every permutation and combination of the same question. I learned to expect it long ago when watching these shows to write my synopses. This was discussed at length in Gov. Palin’s September 12 interview with Greta Van Susteren where she said she was tired of “giving the same dopey answers” to the 2012 question. Gov. Palin does not break promises and she is not going to betray her own confidence. Newbies are not expected to know this, but veteran supporters should know better. This should be old news to any long-time supporter of Gov. Palin’s. Fox News is simply not going to be the first place of her announcement. Bob and Mark is. I don’t think she has beer summits in mind and Gov. Palin does not play golf. Gov. Palin knows full well what she can do without a title versus what she can do with one. She only has a couple of decades experience. She also knows very well what could happen to her influence if she chooses not to run. But, Gov. Palin understands that yes, a title can shackle. She’s been there and done that. The matter of handlers trying to mold and shape Gov. Palin would probably not be much of an issue during the primary campaign. After all, she would be the boss. If handlers try to insult her intelligence, Gov. Palin could simply show them the door and tell the handlers in question to go handle themselves. The general election is where she could lose that autonomy. The GOP establishment would be an integral part of a Palin campaign (or anyone else’s for that matter) and could make demands that she would have to comply with as a condition of their support. Remember that George H.W. Bush was not President Reagan’s choice for Vice President. The party forced his hand. Gov. Palin has intimate and extensive knowledge of this having been McCain’s running mate. She knows what goes on in national campaigns, because she was in one. Her heart-felt concern is legitimate. Gov. Palin is a stateswoman and a citizen public servant. She is not a machine politician. Absent a title, Gov. Palin enjoys unbridled freedom to shape the political debate on her terms, but quite possibly with much less influence. The next title gives her the ability to sign or veto legislation and treaties, and make decisions about war and peace – that is lead this nation. Gov. Palin is carefully considering this for all the right reasons. She’s not pursuing a title or power. She knows the Presidency is a calling. She knows she’s been summoned. It’s public service and sacrifice. She wants to do what’s right for this country and discharge the duties of that office unbeholden to anyone. Yes, we want her to run. None of the other candidates possess a single one of her leadership traits. The others simply fail to inspire. But, we cannot let our zeal for her running turn into petulant demands, whining that “she owes us,” and putting words in her mouth she never said. It was NJ Gov. Chris Christie who said he was not running on Tuesday night, not Gov. Palin. Gov. Palin knows that if she runs, failure is not an option. There’s also an historic element should she run that amplifies failure not being an option. You see, Geraldine Ferraro and Hillary Clinton left some unfinished business. This entry was posted on September 29, 2011 at 6:56 AM	and is filed under Uncategorized. You can follow any responses to this entry through the RSS 2.0 feed. You can leave a response, or trackback from your own site. Great post, Ron – you really nailed it for those of us on her team, so to speak, since the beginning of her national presence in 2008! And we MUST put faith in her good judgment! She knows the scene and the treacherous landscape better than most – having been thru the rigors (and ringer) of a national campaign. Anything that would fetter her excellent gut extincts is NOT for her – nor would she be the effective leader we trust her to be if “shackled” by a GOP machine (we’ve all seen how well THAT’s worked out for us, haven’t we?!?). 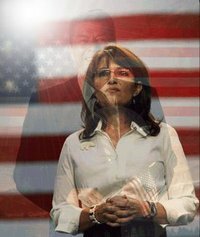 God bless Sarah Palin, and may God grant her the wisdom (and commonsense) to do “the right thing” by her, us and America!! Wow, Robert Devito! I could not have said it any better! I don’t believe Sarah Palin owes me anything, and I will not whine if she does not run. I will, of course be disappointed; but in the end she has to decide what she wants and what is both best for herself and for the country versus any of the rest of us demanding anything. So I get that. But don’t blame or castigate me for seeing qualities in Sarah Palin that the country needs, for supporting her on that basis, and wanting her to run. I do not apologize for exhuberantly and enthusiastically wanting Sarah Palin to be my President and our leader! But I will patiently wait for and abide by her decision, either way.Run Sarah Palin Run! In response to an Adrienne Ross post on c4p (see link). “Very logical conclusion in light of what she actually said to Greta. Sarah Palin didn’t say she was going 3rd party, but that was the decision she had to make. She has ,of course, already climbed out of the petri dish and is viewing the battlefield in 3D, unlike most of us who are weighed down by our own pre-conceptions of political reality. Part of the question she is mulling over is whether the American people are ready to accept a 3rd party. She can visualize the campaign she would run, either way, and I think would prefer an independant run free from the dead weight of the party machine, but is it feasible? gladly ready to make any sacrifice for the greater good of all, without hope of praise or fear of blame. America, the shining city on the hill. After listening to Gov. Palin, on the Record with Greta.. I am not so sure she will run for President.. and if not, she would have destroyed all patriotic constitutional conservatives hopes and dreams, mine included, and for what.. I hope this is not the case, but if so, it would not be very good for the Tea Party, let alone the Nation.. as the Nation needs another Ronald Regan, now more than ever, as we are on the verge of losing the very U.S. Constitutional Republic of America, that was founded over 235 years ago.. That is what is at stake here, and nothing less !! Make no mistake about it.!! These Anti-American Liberal Socialist-Marxists, have all but destroyed the nation, Intentionally, and whose going to stop them.. and most of all, whose going to restore America, back to the US Constitutional Republic, when these liberal fascists, are starting to call for an Obama Regime, without any more elections, because they know that they Failed, and are in desperation mode.. which makes them all the more dangerous, as they are the ones still in power.. This is the nature of our darkest hour.. will it be Freedom, Liberty, and Equal Justice, under the Law of the Land, the US Constitution. in a Free America.. or will it be an Obamacratic Socialist-Marxist Dictatorship Regime, forever in power, dictating and destroying everything, in a land of misery and poverty, of eternal indebtedness, forever.. I believe in Sarah and she will lead America back from the cliff of bankruptcy that the government has taken the country.